In the collective security system of the CIS countries there is a key link. This is the 201st Russian military base stationed in Tajikistan. More than three thousand of our servicemen are serving there. Conditions are not easy. It is not by chance that in the army experience a year of service here goes for three. The members of the Public Council under the Ministry of Defense decided to personally verify how it served to our soldiers and officers on the southern frontiers. The object of the Russian military and geopolitical presence in the Central Asian region – as military experts estimate the 201st base. Moscow and Dushanbe are unanimous: the Russian military base is a guarantor of stability. Close to the border with Afghanistan with its complex domestic situation, the terrorist threat and drug trafficking. It is better to resist such challenges together. That is why a few years ago, Presidents Putin and Rakhmon agreed to extend the tenure of the 201st base until 2042. Russia is helping the Armed Forces of Tajikistan with weapons and equipment, preparing military personnel. Thanks to this help, the army of Tajikistan has grown stronger. It can independently solve many security issues in the region. This reduced the burden on the 201st base and reduced its number from 6.5 thousand to about 3.5 thousand. During a meeting of the delegation of the Public Council under the Ministry of Defense with the base commander, Colonel Sergei Goryachev, he said that the base was staffed by servicemen for 97 percent of the full-time strength. Almost five years ago, it was decided to send here exclusively contract servicemen. There are no conscripts here. This, by the way, nullified a very sore subject before – “hazing”. Among the contract soldiers — privates and sergeants — there are quite a few mature people, under 30. That’s not enough to explain what is good and what is bad. Everyone understands and holds on to the place. Good social benefits, high (compared with the average salary in the Russian outback) monetary allowances made the service on the 201st base very attractive. Structures that produce candidates for service under the contract, have the opportunity to choose the best. As the base commander said, There are practically no “complaints”. People come to serve consciously, well representing the nature of the service and the characteristics of life in Central Asia. The chairman of the Public Council under the Ministry of Defense, the chief editor of the MK, Pavel Gusev, during a meeting with contractors, asked about the possibility of getting a higher education or becoming an officer. He was pleasantly surprised that contract servicemen have such opportunities. According to the federal law “On the status of military personnel”, a contractor has the right after entering into a second contract to enter a higher education institution, he is granted additional leave to pass the session. The base commander reported, in turn, that this year about 50 contract servicemen wrote a report on admission to military schools. There is a selection of the most worthy. Member of the Public Council, Lieutenant-General Rafael Timoshev asked about the progress of the infantry in combat training and how often they are engaged in field conditions. “They only returned from the fields on April 5,” the base commander Sergey Goryachev said. – Participated in battalion tactical exercises. Now lead equipment and weapons in order. According to him, the unit received a rating of “good.” Fighters train mountain training not only at the local Leur training ground, but also in Russia, on Terskol. Another member of the Public Council, director of the Center for Analysis of Strategies and Technologies of Rusla Pukhov, asked the contract servicemen if all the payments they were making reached them. It turned out that the soldiers have no complaints here. I was interested in the delegation of the Public Council and this topic: how is the Syrian combat experience used in combat training of units that serve almost in a “hot spot”? As it turned out, this experience works in the 201st base at 100 percent. In the classroom practiced new tactics management system is changing, it becomes more flexible and operational. For example, in the location of the base recently appeared auxiliary control point. With the necessary means of communication. 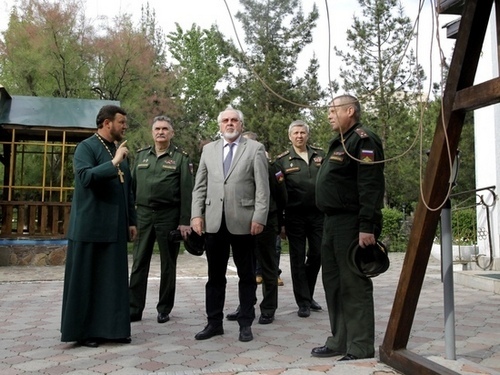 Such “field headquarters” appeared in the Russian army after Syria. Increased attention was paid to the new danger – quadrocopters. Practiced means of dealing with “not asked” drone. Created air assault posts. Opportunities for educational facilities and difficult climatic conditions help to prepare units for service in Syria. In Tajikistan, in summer, the temperature reaches +50 degrees. So the units come before being sent to Syria here to undergo acclimatization. During a meeting with the personnel of one of the platoons of the mountain battalion, the public men asked about the housing conditions of the contract soldiers. It turned out there is still work to do. Office housing for all family contractors is not enough. Some people have to rent a house. The state compensates for sublease fees. But only partially. As the deputy platoon commander, sergeant Alexander Ivanov, He and his wife pay 11,000 rubles a month to the apartment owner. At the same time, compensation for sublease is about 3.5 thousand rubles. The rest is at your own expense. But, according to Alexander Ivanov, “a decent allowance for money, we can afford with our wife.” The command as it may helps the military in the housing problem. The priority for the provision of service housing for large families. Two such families members of the Public Council visited. And not with empty hands – they gave on television to large families of sergeant Ruslan Sergazin and senior warrant officer Fedor Fedotov. According to Pavel Gusev, the Public Council pays special attention to social issues. we can afford with my wife. ” The command as it may helps the military in the housing problem. The priority for the provision of service housing for large families. Two such families members of the Public Council visited. And not with empty hands – they gave on television to large families of sergeant Ruslan Sergazin and senior warrant officer Fedor Fedotov. According to Pavel Gusev, the Public Council pays special attention to social issues. we can afford with my wife. ” The command as it may helps the military in the housing problem. The priority for the provision of service housing for large families. Two such families members of the Public Council visited. And not with empty hands – they gave on television to large families of sergeant Ruslan Sergazin and senior warrant officer Fedor Fedotov. According to Pavel Gusev, the Public Council pays special attention to social issues. – Give thanks to the Minister of Defense for putting the army in order. “Indeed, our minister today made the Russian army a world-class army,” concluded Pavel Gusev. – See, competition in military universities from 7 to 11 people in place. In the Krasnodar Flight School, where we were also, only among the girls is a competition for one place 20 people. And they want to be not just pilots, but fighters. “Now our gun is the word.” Raise, inspire, guide. And there already, when the edge approaches, when the point of return has already been passed and there will be nowhere to return – how will the Lord grant. Actually, the 201st base also exists so that no foreign policy threats can bring the matter “to the edge” for Russia and its allies. So far, it has been possible to do this well by the military personnel of the base at their responsible turn.